Recently I got a Notification from my Close friend in Facebook suggesting me to try a Android App.I too Eagerly clicked over that and installed from Google Play. And the next day i was asking her how did you invite me via Facebook ? or just spammy Notification just like another Candy Crush Saga :D.Then she shown this page to me App-invites - Facebook Developers page.I was Wondering how could i invite From My App(Android) and checked out the Documentation About the App invites and it was Quite confusing first,however after lot of Searching over Stackoverflow,reading the Documentation thrice i could build a Simple Invite System from My Android App to Invite and Suggest the App in Facebook to Engage to Download or to open the app. 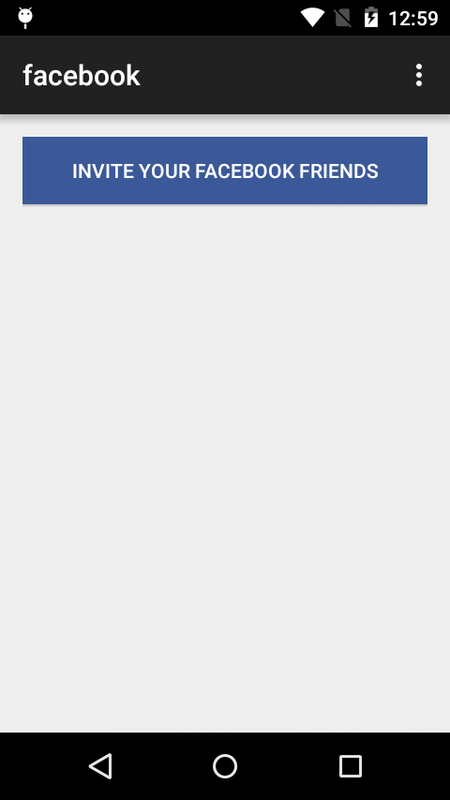 Here we're developing a Simple Android App that has invite button and directs to invite popup and invite our friends in facebook. Android Studio With Recent SDK installed (Preferable for Dependency Adding). Register A Facebook App with Key Hash and Package Name. Little patience to Debug the App via logcat. A little Knowledge About Developing Android Apps and Java. Before Writing this post,I have created a small App which made me many troubles such as App crashing,Low speed internet Connectivity(My Fate :D ) and Some Exceptions.here i will completely write my experience and exception and how i handled them.If anything apart from this let's discuss in Comments or over Email. here we can discuss about creating Facebook App and obtaining APP ID and Secret keys for our app,and providing platform as Android,Adding key hash and package name. visit here and Create new App - Link - Facebook Developers Console. select the Platform As Android > and provide a Name for Your app corresponding to your android app. 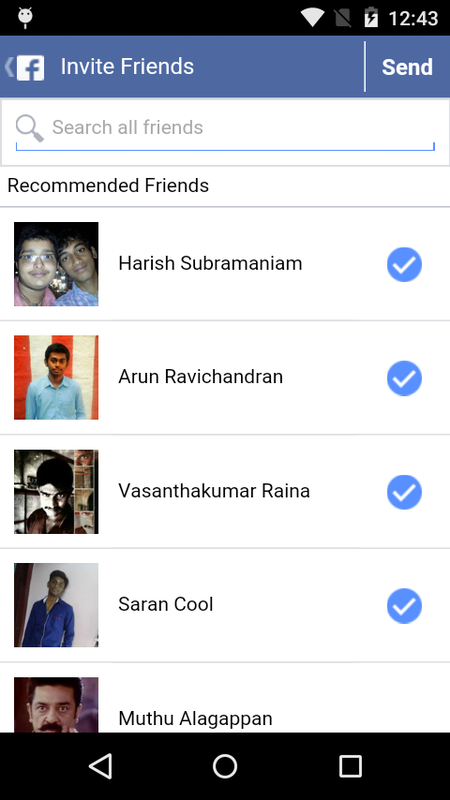 Choose a Best category that fits your App(Most recommended by facebook to Rank your app). At the top right of the Page click skip the Quick start and you will be redirected to App dashboard which you have created. Add contact email also and save it. Get your APP ID and make your App live for production in status & review > toggle the button to enter in to Production mode. just with your onCreate method add this code and replace with your package name correctly and run your app in Debug method(by Default it would be) and check your Logcat for the keyHash : XXXXXXXXXXXXX. Just copy it and visit your app in facebook Developer Account > Settings > in the Android Section (Which you have already created with package name) in the key Hash Field add it over and enable single-signon(may be useful for apps with login) and save the app settings. Note : this is preferable method which i have created the key added to my Account. I just love Android Studio mainly because it automatically adds the dependency with one line in app gradle.However i'm not expert in Working of Gradle system! however i know how to use it projects to add dependency without any pain unlike Eclipse you have to Add it and point the locations and export while you're building it finally. Open You Android Studio(i hope you have installed latest SDK and tools installed). create new project with a Empty Blank Activity. Now just open your app gradle file and add the entries to resolve the dependencies via maven repository. and just sync your gradle or rebuild your project. Note : Mainly this Dependency support from API 9 and above.just change minSDK as 9 and higher till Android API 22 or L (your choice). lets just first see about setting permissions and adding entries in Manifest file regarding Facebook SDK setup. I have added a default activity to be launched and shown in launcher. added meta-data content containing facebook app id as string from xml file. don't just hardcode your APP ID, it may create exceptions,it is recommended by facebook to use as String from xml string. Finally add Permission for internet appropriately since we are doing network based operation in our app and facebook needs it. So just use this example to add your manifest file,and check that you have added facebook activity in your manifest file too. Here we are initializing the App with facebook library and set the view as XML layout and then simply add a link and preview image preferably a large image is recommended. 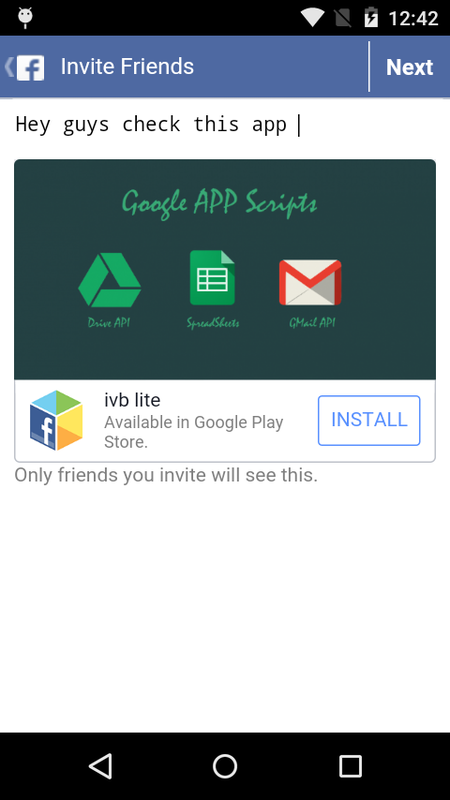 get your App links from facebook to launch the activity from facebook or web or some other apps.learn more about app links here in my previous article. create App link from here. in the Android section , Add your package name for launching the app if it is present in the particular device or else just as fallback it may be moving into playstore. Create a new Applink and just copy it. Just replace with your app link in the code given below,and chenge your imageurl too(must be high resolution image). 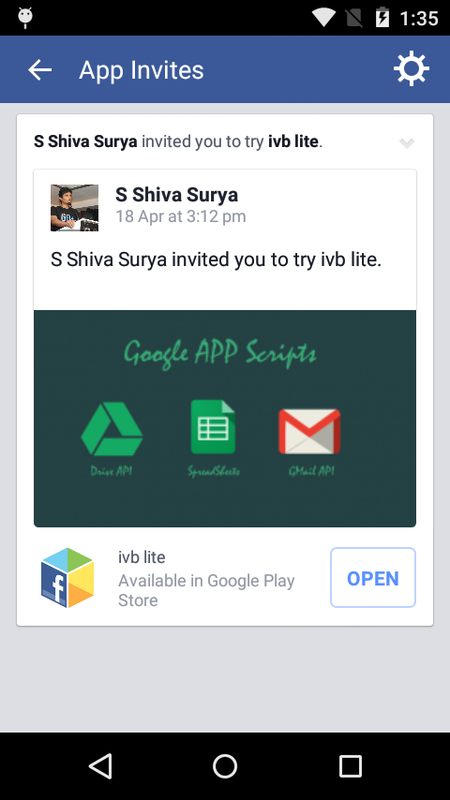 Thus while Opening your app this will default invoke to app invite activity of facebook. Here facebook verifies the user has installed however latest facebook app in device or else as fallback it opens as webview facebook.You must be logined in the facebook Native app or Webview already will be fine for testing. 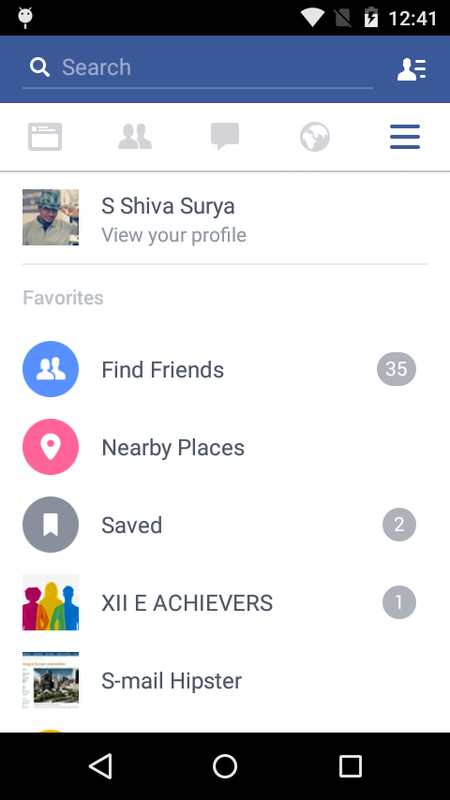 This Invite Feature doesnt need any Login With Facebook Feature,This just Simply enables you to invite your friends when you're logined with facebook app. null pointer Exception for not Adding Facebook App ID in manifest file. null pointer Exception for Hardcoding the APP ID in manifest File. Facebook App canvas Error for not adding key hash mismatch. Null pointer Exception for not initializing Facebook SDK before setcontentView method. However if you didnt find any error if you come across,comment below lets discuss it and resolve and make this post more usable. For hugs/bugs/errors/help/suggestions just comment below or mail me to s.shivasurya@gmail.com or chat with me in Facebook/G+ or tweet me in twitter.Share is care. i am using the Same Code for the invite App box.. Everything is Fine Not Getting any Error.. But When I Click on the Button I am getting nothing..
i Checked the Button Listener is working Accurately..Because I Am Getting the Toast when I Click on the Button..But App Invite Dialog is Not Appeared.. Please Help me Brother..